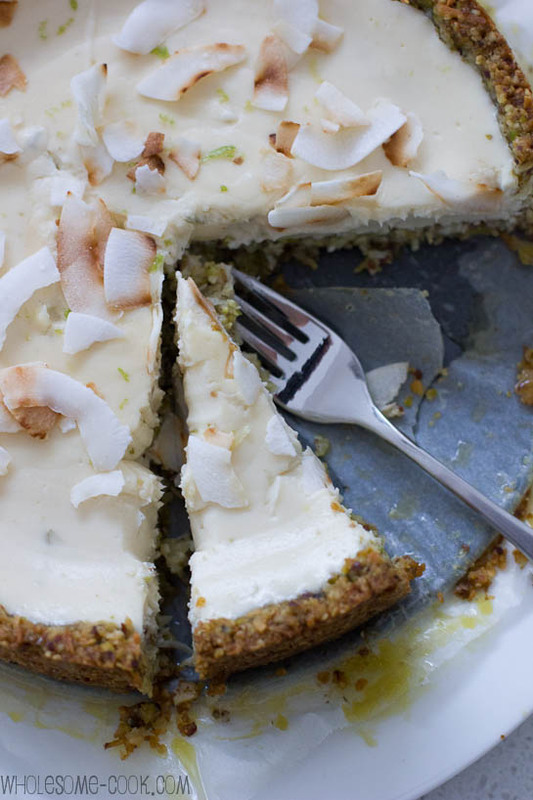 This silky smooth Sugar-Free Yoghurt Cheesecake with a hint of lime is absolutely amazing. Gluten-free, sugar-free, nutrient-rich and totally guilt-free! Last Wednesday we had our datenight. I spent most of the day running between the shops and the kitchen, prepping for dinner and brainstorming various dessert ideas as such. 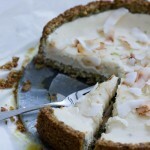 I settled on the Crunchynut Yoghurt Cheesecake from her IQS Cookbook instead. And I am so glad I did! Wow, I seriously had trouble stopping at just one slice. Actually, I might have saved a couple of slices for breakfast *grin* and to be honest, there’s nothing wrong with having this cheesecake to start your day. In fact, if thrown together into a bowl, majority of the ingredients would make a nutritionally balanced breakfast indeed. And yes, sugar-free, too! Even our dog quickly worked out this was a tasty number for sure! I changed the recipe up a little since I didn’t have the required 24 hours to hang the yoghurt to make it into cheese, nor did I actually have the required amount. Instead I used a tub of cream cheese mixed with natural yoghurt that I hung for about an hour, while I ran back to the shops to get eggs which I had forgotten to buy during my first and second trips there. What did I tell you. Since I wanted to make the cheesecake a little more refreshing, it made perfect sense to add some lime juice and zest to the mixture. 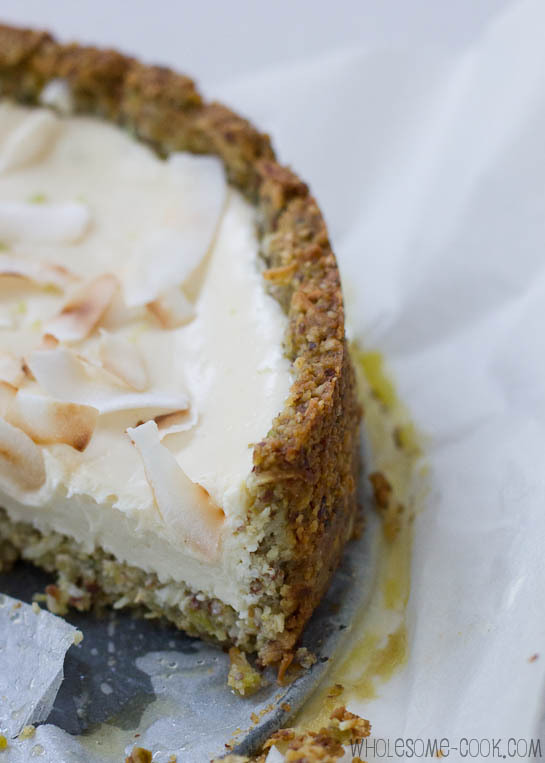 As for the crust, I used the recommended amounts of pistachios and coconut, but substituted some of the almond meal for LSA (linseed, sunflower and almond mix) and… hemp seed. Now, hemp seed is something I have recently discovered and love – they come hulled so that you are not running the risk of mature plants growing in your compost bin. The seeds have a slight nutty flavour and contain not only all 10 essential amino acids, but are also rich in essential fatty acids (the omegas). Perfect nutrient boost for the cheesecake. 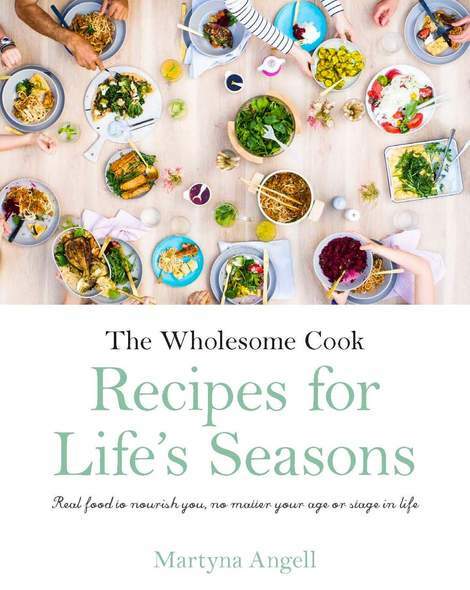 If you’re really serious about busting sugar for good, check out also Sarah Wilson’s cookbooks. Adapted from Sarah Wilson's I Quit Sugar Cookbook. *If you can't find hemp seeds, just use 1/2 cup almond meal and 1/2 cup LSA. Preheat oven to 180C (160C fan-forced, 325F, gas mark 3). Line the sides and base of a 23cm spring form tin with baking paper. Pour yoghurt into a fine mesh sieve suspended over a bowl and allow the whey to separate from the solids for about 30 minutes. Discard the whey. Grind pistachios in a food processor or chopper until semi-fine. Transfer to a bowl and add the coconut, almond meal, LSA, hemp seeds and cubed butter. Rub with your fingers to make a dough - it will be ready when it forms a ball. Press dough into the base and sides of the tin to an even thickness. Bake for 5-8 minutes or until the edges are starting to turn golden. Remove from oven and allow to cool completely. Combine the cream cheese, strained yoghurt, coconut cream, rice syrup, lime juice and zest in another bowl. Whisk together. Add egg and fold it in gently, but making sure it's well incorporated. Pour mixture into the cooled base and return to the oven for around 30 minutes until the mixture pulls away from the base but is still custard-like in the middle. Remove from the oven, cool to to room temperature before placing in the fridge for couple of hours to set. 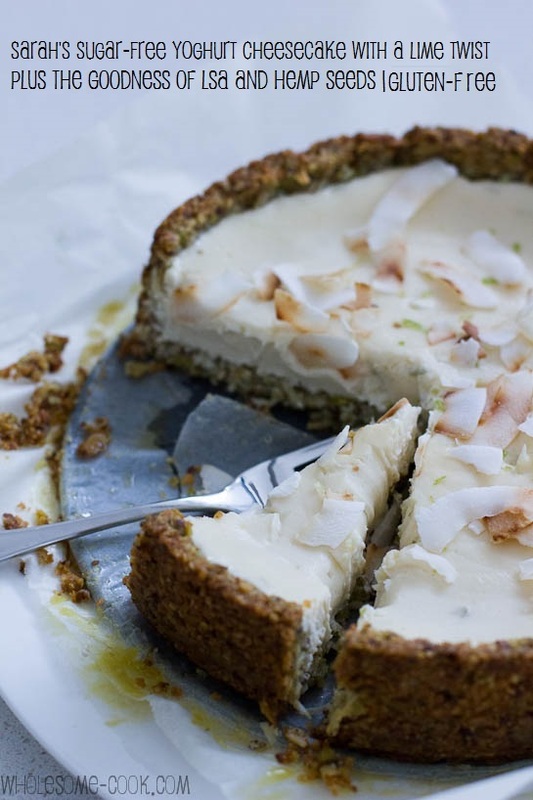 Serve with a sprinkling of coconut chips and extra lime zest. The cheesecake will keep in the fridge for upto 5 days as long as you keep it covered with cling wrap. Could you swap the pistachio’s for another nut such as almonds or walnuts? Hi Bec, you could use hazelnuts or almonds. G’day! it DOES sound delicious and looks it too! Never used hemp seeds and might now have to put them on my list to do! This cheesecake is amazing! Hard to imagine cheesecake being any better for health than this. The flavours from the nuts must be incredible. I am tempted to give this a go soon. Oh I love your doggy! I have two Jack Russell’s who love cheese. They don’t get much but they love a little snack in the evening before dinner. They have such big personalities don’t they?? Kasha loves cheese but we also don;t give her too much. She can smell it though in all shapes and forms and gets excited. Hi Lisa, are you in the USA? I heard of this, but when contacted a couple of the Australian brands have come forward and advised that Aussie brands are safe to use as levels of arsenic are negligible. Alternatively, you could use a few drops of Stevia and a little glucose syrup to help with consistency – or if you are not completely fructose-free I’d suggest some raw honey. I love the addition of a little bit of cream cheese. What a pretty cheesecake. Gorgeous, I want a slice! Gosh! This sounds wonderful. I have got to start making healthier desserts… my denim jeans are crying out for it!! Yummy! I have never tried hemp seeds but after seeing so many recipes using them I must and this looks like a great recipe to start with. I have Sarah’s book and have loved everything ive made from there so far, but never tried the cheesecake. Your addition of the lime is a great idea though and when I get around to making this i must remeber to add that! I love that I found this delicious sugar free yogurt cake Martyna… I have never taste a sugar free cake before so, I’m glad that I found this one and love to try it.. YummY! Hi linny, LSA is a mixture of ground Linseed, Sunflower seed and Almonds. Highly nutritious in good fats and fibre. It makes a great addition to cereals, smoothies and yoghurt desserts. Hi Martyna, I’m in Cape Town, South Africa and would love to try it. I haven’t seen LSA around. If you have to make it yourself, what are the ratio’s between the 3 ingredients? Or is it a regular product that health shops sell? Hi Annelise, you should be able to find LSA (ground linseed, sunflower and almonds) in health food shops. Otherwise I would go with a 1:1:2 ratio. I make my own yoghurt with a bought culture. Before flavouring I take off the cream that has set on the top. Please can anyone help me with uses for this cream. It does have sugar in.